Every week, we will feature one member of our executive leadership to share a little bit about themselves. This week, USAP’s President and CEO, Joshua Walker. While I was born in North Carolina but consider myself a proud Virginian, I actually spent the majority of my childhood in Japan, living there for 18 years. My hometown is Sapporo, Japan, which hosted the 1972 Winter Olympics and is on the northernmost island of Japan, Hokkaido. Thanks to the amazing opportunity to grow up abroad, I’ve always been interested by international affairs, learning more about different cultures, and representing the United States overseas. I think my career reflects that. In addition to my role as President & CEO of USAP 2017, I’m also the senior vice-president of global programs at APCO Worldwide, a global strategic communications firm. Before my time at APCO, I served at the U.S. Department of State in Secretary Kerry’s Office of the Chief Economist, as well as in Secretary Clinton’s Global Partnership Initiative as a senior advisor. I began my career as a Fulbright Scholar to Turkey where I was able to work with the U.S. Embassy Ankara briefly, then the Turkey Desk of the Bureau of European and Eurasian Affairs at the State Department, and have also worked for the Joint Chiefs of Staff at the U.S. Department of Defense. Deep down, I’ll always be an academic at heart. I earned my bachelor’s degree from the University of Richmond, a master’s degree in international relations from Yale University and a Ph.D. in politics and public policy from Princeton University. Since completing my education, I’ve taught at Brandeis University, George Mason University, George Washington University, Harvard Kennedy School, Middle East Technical University, Istanbul Sehir Merkez, Tokyo University, Transatlantic Academy, Princeton University, University of Richmond and Yale University and am a Transatlantic Fellow at the German Marshall Fund of the United States, a leading global policy think-tank based in DC. 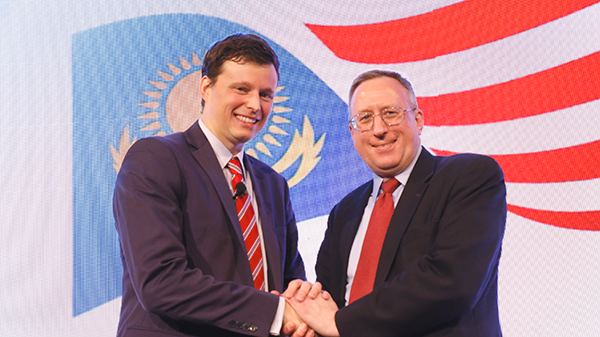 Why You’re Excited about Expo 2017 in Astana? Simply put, the Expo 2017 in Astana is THE global event of 2017. No other national or international event this year comes close in either magnitude or importance. Over 100 countries will be in attendance from across the globe, and over five million visitors are expected. Whether you’re a diplomat, business leader, or just a curious traveler, the first World’s Fair in Central Asia will have something for everyone. I wouldn’t miss this for the world.